The different types of floss and tips for flossing make it possible to keep the tight spaces between teeth free of food particles and plaque. That goes a long way when it comes to fighting tooth decay. 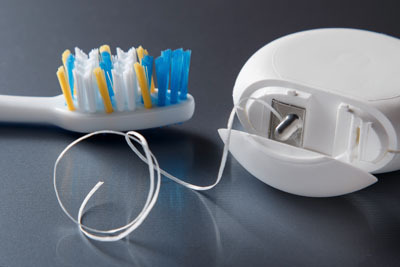 Dental floss is used to remove the plaque, food particles and bacteria that become lodged between teeth after meals. While some of this debris will be eventually washed away by saliva, the rest can be lodged between teeth. Keeping the spaces between teeth keeps gum disease and tooth decay away. Those who fail to floss daily remain vulnerable to common oral diseases even if they brush their teeth twice a day. The bristles of a toothbrush simply cannot reach the tight spaces between teeth. Fortunately, there are different types of floss and tips for flossing that make it possible to keep these areas clean. Dental floss has been used as far back as the 1800s. It was often made out of silk back then, but modern floss is typically made from plastics that are liquefied and stretched into thin strands. These plastic floss materials are much stronger than silk or other textiles. Other materials like flavoring and wax are often added to make flossing a more pleasant affair. This is the common type of floss that comes to mind when the topic comes up. However, there is lots of variety. Some are waxed or flavored with mint to increase their appeal. While it is normal to be fixated on the type of floss one decides to use, what really matters is the flossing technique used. There is a noteworthy difference when it comes to waxed or un-waxed floss, though. The former slides through tight spaces much easier. Floss picks are arguably the most convenient way to floss. The handle holds the floss for the person, so only one hand is required to floss. Having the floss held in place by the handle also makes it easier to floss the back of the mouth. However, floss picks are not as effective as regular floss. It does not fully form a "C" enclosing the tooth, so it does not scape its surfaces as effectively. Also known as dental water jets, oral irrigators are flossing tools that use a high-pressure stream of water to remove food particles and plaque between teeth. It also helps to improve the health of the user's gums. Oral irrigators are easy devices to use as well. The user simply puts it in their mouth, and the device does the rest. It is best to close the lips once the machine is inserted to prevent water from splashing out while it cleans. Contact one of our dentists to learn more about the different types of floss and learn flossing tips. For more information or to schedule an appointment with Lee Dentistry, request an appointment in our Silver Spring dental office here: https://cosmeticdentistsilverspring.com. Or call us at (301) 605-1123.